An interview with Mr. Collins CEO of Punch TV. We think the most important piece to understand about the new company, is the closing text Mr. Collins added in answer to question #7. To paraphrase…. it’s important to understand that Mr. Collins never had the opportunity (i.e. power) to execute his vision and ideas when he was associated with Mr. Steven Samblis. As many of you know, Mr. Samblis went to great lengths to maintain his absolute control over the company. Given that Mr. Samblis had provided for himself majority control over all aspects of the company, the buck stopped with him, and him alone. Mr. Collins could not make anything happen unless Mr. Samblis agreed, and approved. Regardless of what you may believe about the defunct Samblis-controlled IC Punch Media, it appears Mr. Samblis called all the shots, not Mr. Collins. We also think it’s important to understand that, unlike Mr. Samblis, Mr. Collins does not appear to dodge hard questions, and as he was aware he was on-the-record, he did not appear to parse his words like many of you believe Mr. Samblis did and still does. Many think, that is certainly a refreshing change from Mr. Samblis. Additionally, it appears Mr. Collins makes himself available to answer questions on message boards also… and he does so AS HIMSELF ! Again, many believe a refreshing change from Mr. Samblis. Now there are some who see this as a negative, i.e. a CEO posting (pumping) information about his company’s stock, and we would agree to the extent pumping was involved. However, when the CEO of the company comes on a message board to face his investors questions, for the purpose of addressing those questions… this is not necessarily a bad thing. In fact, it can be a good thing for current investors, as well as prospective investors. For it takes straightforward answers, straight from the CEO, to impress prospective investor’s to become current investors… and that’s a good thing for current investors. Folks… read Mr. Collins’s responses to the questions put to him and decide for yourself if you believe they are sincere and have merit. Also keep in mind that what he says about not having control over implementing his ideas when he was with Mr. Samblis, we all know to be accurate. So… now that the buck stops with Mr. Collins, investors will be able to see the possibilities that could have existed had there been no association with Mr. Samblis. It is now time for Mr. Collins to show investors what could have been had Mr. Samblis not stifled his creativity and energy. It will be interesting to see once and for all, who is the proven leader, and who is the proven loser. Is Steven Samblis a racist ? Take a look at the following post. Although it was posted under the alias SunTzueyes, many followers of Mr. Samblis’s postings over the years are absolutely convinced this is Mr. Steven Samblis posting. Someday if (and we believe when) it’s proven beyond a shadow of a doubt via computer forensics that this is in fact Mr. Steven Samblis posting, the world will know the true character of this CEO. One has to wonder if the derogatory term, used twice in the post, was intentional. If it was not used intentional, then there appears to be a more concerning deep rooted, and inherent bias involved. The poster (assuming of course it’s actually Mr. Samblis) will likely respond, defensively, that it is impossible for him to be racially biased, why else would he have partnered with Mr. Collins in the first place. Well, consider the character of Mr. Samblis overall. Many say he simply uses people for whatever benefit he can derive from them, then discards them such as has apparently done with investors who were extremely loyal to him in the beginning by purchasing large amounts of his company’s stock. It’s possible the partnership was based on Mr. Samblis taking over Punch TV, with no intentions of ever letting Mr. Collins have a true leadership role of the company. 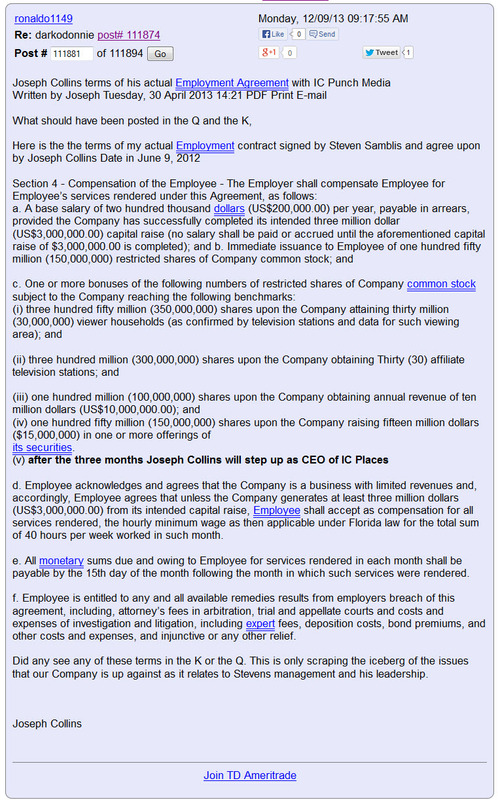 It’s clear within the employment contract (details here) that Mr. Collins was to “step up” as CEO in “90 days”, yet Mr. Samblis maintains that Mr. Collins was attempting to take over the company by illegally announcing he was the new CEO. Look close at the terms of the contract that Mr. Collins released – there are NO contingencies attached to this stand-alone clause of stepping up as CEO. Folks, you have seen the post, you have seen the contract, you know Mr. Samblis’s history, now YOU need to decide if you believe Mr. Samblis is a racist. It seems apparent that when Mr. Collins attempted to claim what had been promised to him in the beginning (via written contract), Mr. Samblis apparently turned on him and began to tear him down. Not only was Mr. Collins of no further use to him, having acquired all his assets, Mr. Collins now became a threat to Mr. Samblis’s ongoing efforts at maintaining absolute control over the company. Mr. Samblis… if we have this all wrong, please enlighten investors to why such derogatory terms were used in the post. Liar, Liar… Pants on Fire ! Well, Mr. Steven Samblis, CEO of Imagination TV (formally IC Places, Inc.) has put out a challenge over on Investors Hub. He states… opps, we mean SunTzueyes states (lol) that he has never told a lie about his management of his company. Let’s see if we can’t put an end to this here and now. We are reminded of the similarity between Mr. Samblis, and President Obama and his administration. If you follow politics at all you have undoubtedly heard about the now proven lies Mr. Obama and his administration told about his signature piece of legislation, Obama-Care. If you like your doctor – you can keep your doctor. If you like your health plan – you can keep your health plan. PERIOD ! Obama-care will save each family $2500.00 a year. Again, thanks to Mr. Gruber we now know it was all a pack of lies. Yet the Obama administration continues to this day to extol the benefits of the plan, and pivots away from addressing the facts of how their own adviser (Mr. Gruber) states (on video) that they needed to lie about the law because the American people were too stupid to understand what was good for them. Remind you of anyone ??? We see striking similarities between the Obama administration and the Samblis administration time after time. First, as an aside, Mr. Samblis… please give us your definition of a lie. Since you think you have not lied, you must have a different definition of what a lie is in contrast to so many others who have cited situation after situation in which they feel that you have lied. Please… define “lie”for us, and it would be great if you could give one or more examples of situations you cite as lying so readers can get a feel for what your definition of a lie is. Additionally, you have insisted of posters to post proof of what they believe are situations you have lied about. Well, as seen below, (and multiple other times), you have called Mr. Collins a liar and a thief…. yet you, who calls for others to prove their statements, offer no proof that Mr. Collins lied and stole. Are investors simply to take your word for it? Why not live by the rules you place on others ??? You made the accusations… now provide the proof to support your accusations. Now… on to the lies… with proof ! 1) Let’s start with this lie first. In this post here, you state Mr. Collins was fired (in addition to calling him a “crook” and a “liar”), yet you offer no proof in support of your statement. In post #30929 on Investors Hub (which has since been deleted for an unknown reason), however available here, it appears, by your own words, that Mr. Collins in essence quit. After all – it was Mr. Collins that rescinded the purchase, not you. You boast about how stupid he was in doing so. So… were you lying then, or are you lying now? 2) Departure of the previous president of your company. In our post here, we provide multiple documents refuting your statements that you fired the previous president, when in fact we provide that actual resignation letter, and not only does the past president indicate she resigned, but there is corroborating witness testimony that this was what actually happened. 3) Your Employment Contract. You state in the August 12, 2011 Quarterly report filing here, that “The company does not have employment contracts with its majority shareholder, who is the executive officer.“. Then…the public filing dated 11/14/2012 states the following: “On November 18, 2005 the Company entered into an employment agreement with Steven Samblis to be our Chief Executive Officer.”. So… we‘re you lying on every SEC filing prior to 08/12/2011… or were you lying on the 11/14/2012 filing??? 4) Lawsuits against the company: The recent SEC filing, the 10K (see here), as well as the previous filing, the 10Q (seen here) there is NO mention (or can be said, “disclosure”) that there is in fact a legal proceeding against the company. See it here. In fact, the filings state.. “We are not engaged in any litigation, and we are unaware of any claims or complaints that could result in future litigation.” (emphasis added). Then… it becomes known that there was in fact litigation that had occurred during these 2 filing periods. See details here. So… we’re you lying on the filings, or are the court documents lying??? Were you lying when you agreed to a settlement, then defaulted on that settlement agreement? 5) Reverse split: This one doesn’t even need any document references here. As everyone knows, there were a vast number of posts over multiple message boards where you stated you would not do a reverse split of the stock. In several instances you used the word “never” in reference to the possibility of a reverse split. This was likely the topic that you most addressed in your message board posts, and steadfastly disputed anyone that would even hint at you doing another reverse split. Then… as everyone knows, on March 27, 2013 you do a reverse split. (followed by another one 7-months later on 10/17/2014. In this post you state Larry tried to sell you the website. Then… Friends posted the actual email exchanges between you and Larry, which clearly demonstrate you were not being truthful. (See them here.) As can be clearly seen, a) Larry did not contact you to sell the sites… YOU made the initial contact and requested a purchase… several times, before Larry agreed. And b) referring to the “hugely inflated price” as you like to state and post… an agreed upon price of $1500.00 was struck. However, due to your message board posting where you blatantly disrespected Larry… Larry cancelled the deal. Then you later (October 27, 2013 email) offered over three times that amount, voluntarily, to purchase the sites, but that offer was refused (see the next email). Clearly, you have lied about actual events surrounding the purchase of those sites. 7) Finally, for the biggest lie of all (as if the above several weren’t enough to prove the point)… your use of bogus aliases (mrighttrade, dotd ,zurich, Bzippy, FLWright and of late SunTzueyes). 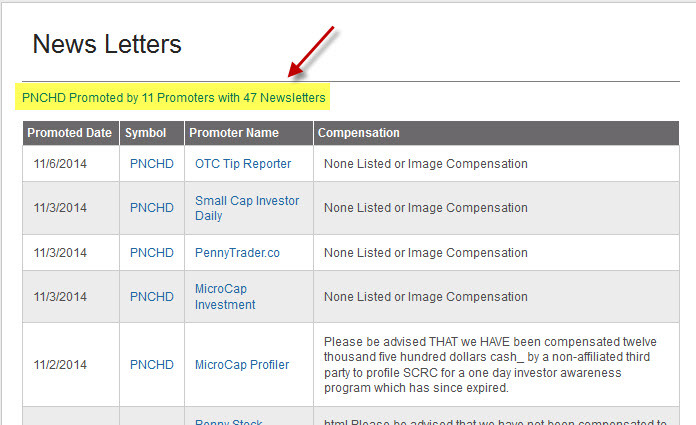 The only proof needed for investors is for readers to simply READ the posts of the bogus aliases. It is obvious to most all that these posts were made by you, yet you vehemently deny such, as you are likely aware that being caught doing such would land you in some serious legal trouble. We are confident that at some point concrete proof will become available that proves beyond a shadow of a doubt that these posts were posted by you. Although the average investor may not have the power or authority to secure such documentation, and you may feel you have gotten over on them, the US Government does have such power and authority, and someday you may regret having done so should they choose to pursue the issue. The way you appear to thumb your nose at the SEC, we feel it’s only a matter of time before they address the issues with you and your company, just as they have previously. Perhaps they will feel you didn’t learn your lesson the last time they cited you. Now, as most of you know, we could go on and on giving example after example of instances of where Mr. Samblis was, shall we say, reckless with the truth, including omissions of clarifications such as the $192,000 per airport statements you let stand without correcting such. Although some of these additional instances would be open for dispute, we think there are no better examples of questionable actions, that many would call lying, then the instances involving the SEC reporting (and ones with supporting documents proving lying) . These SEC reporting discrepancies are clear, documented, and clearly a misrepresentation of the facts. Many would say a blatant disregard and disrespect for the authority of the SEC, and investors in general. So… stickie or bookmark this one because you know this issue will come up again (and again), because just like the Obama administration’s concept in addressing integrity issues, they double-down on the lies in hopes that you are stupid enough to someday believe them if they say it often enough. There are those that think Mr. Collins is a proven leader, as Mr. Samblis apparently did, however now they think that Mr. Samblis is a proven loser, having destroyed the company to the point that after 4 reverse splits of the stock, several name changes of the company, and several ticker symbol changes… the stock is currently selling for under a penny, and volume is almost non-existent. Conversely, Mr. Collins company is coming on strong with bold initiatives such as taking his company public. Only time will tell who is the proven leader, and who is the proven loser. Imagination TV stock back down to .006 ! Yes folks… less than a month after a massive reverse split of the stock (the 2nd. in about 7-months), which wiped out most current investors, the stock is about to hit the trips again. Today’s volume… an embarrassing 457 shares traded all day. As report cards go, this one is not looking too good for Mr. Steven Samblis, CEO of the newly renamed Imagination TV (formally IC Places, Inc.). Investors seemingly have no confidence in the company, it’s ability to generate revenue, or, it’s CEO, Mr. Steven Samblis. 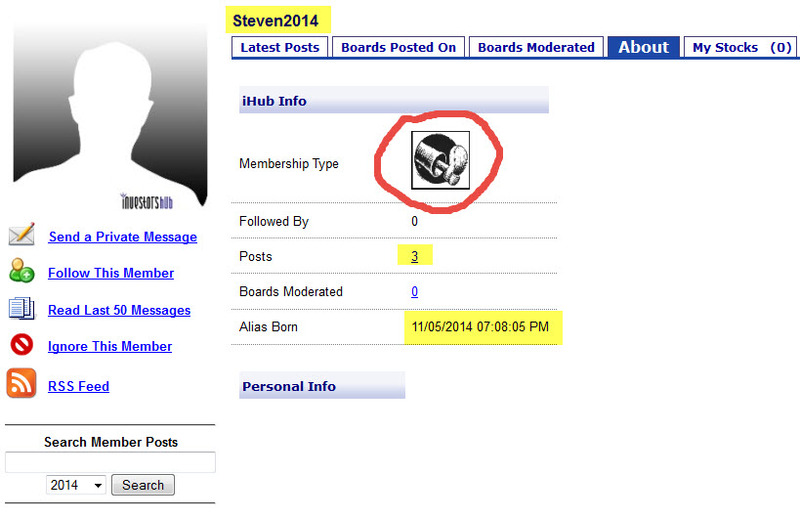 The new news on the message boards is the emergence of Mr. Samblis’s nemesis, Mr. Joseph Collins. Apparently Mr. Collins learned a thing or two about forming (or in this case buying) another public company and rebranding it to Urban Television Network. It appears Mr. Samblis has adopted yet another bogus alias SunTzueyes, and has taken to the newly formed Urban Television Network (URBT) Investors Hub message board to bash Mr. Collins. You can follow along here. Many seem to think that IC Places and Mr. Samblis were far better off with Mr. Collins in the picture. This post by Milesblue42 sums it up for many. Milesblue is right… Mr. Collins was never afraid to face his investors – AS HIMSELF, and address some difficult questions. As an example, here is the post we did as a result of an interview we did with Mr. Collins shortly after the breakup. And here is a post which highlights the difference between the two men. An excerpt from that post is shown below. Time will tell which man has the ability to create a real company that actually returns earnings and profits to investors, however many say that Mr. Samblis has already failed miserably at his attempt. It is very hard to imagine Mr. Samblis ever making a go of turning around the results of his decisions and actions to date in running his company. Say what you will about Mr. Collins, but perhaps his time has come to kick his company into high gear, given the new opportunity of a public company, without Mr. Samblis having the final say in what happens. Mr. Collins… we would welcome the opportunity for you to be interviewed again in order to defend some of the accusations “SunTzueyes” has levied against you. Perhaps now would be the best time to set the record straight. WOW… what a hot mess this Steven Samblis situation is ! Yes folks, Mr. Steven Samblis, CEO of ImaginationTV (previously IC Places, Inc) now states in a public press release ( here ) that he has retained the Law Office of Greg Loomis for the “preservation” of Imagination TV’s rights under a written Content Agreement entered into on March 12, 2012 with ConnectiVISION / ClearVision Networks. Wait… what ??? Preservation of rights ??? Doesn’t a written legally binding contract do that? Could he mean “enforce” his rights? Are they using a play on words again in an attempt to entice shareholders, and more importantly potential investors, to have an increased level of confidence that revenue is at hand? Well, that’s for you to judge, but based on Mr. Samblis’s business history, we suggest you research Mr. Samblis’s many previous press releases prior to making your final decision. It also wouldn’t hurt to read through a few previous posts on this blog for more information related to Mr. Sambli’s integrity. The “search” function at the top of the page comes in handy when searching for previously posted information. 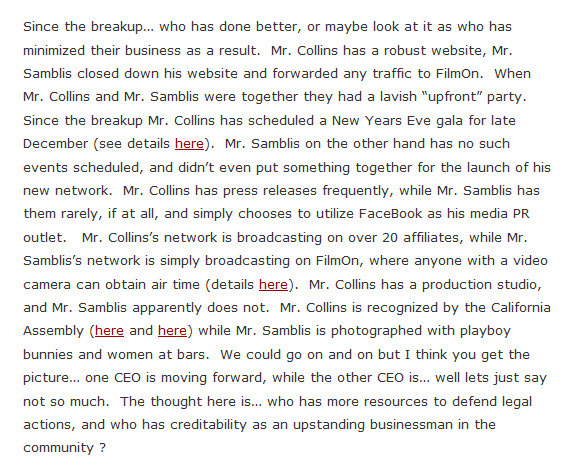 In another matter related to Mr. Samblis… it appears that after a period of silence Mr. Samblis made an appearance on a message board dedicated to matters related to Mr. Collins, and what appears to be his new public company Urban Television Network ( link to board here), trading under the ticker symbol URBT. After 3 posts, he get the boot. Reason is unknown, however it would be a reasonable assumption that it may have something to do with his previous online message board activity. Now, in his first post (shown below, or available here) Mr. Samblis states that Mr. Collins “by lying to the public in fake press releases saying he was now CEO and Chairman of the company when in fact he was not.” Well… it would appear, if one believes their lying eyes, that Mr. Collins was acting on the provisions in his contract of sale. Complete details are listed here and here. You will also find information related to Mr. Samblis’s assertion that Mr. Collins had a copy of the Samblis Employment Contract prior to the sale. You will see in the documentation listed that the employment contract was not listed in the SEC filings (prior to Mr. Collins pointing that fact out), so, it is reasonable to believe that if Mr. Samblis did not disclose such to the SEC, that he gave a copy to Mr. Collins? It’s possible, but any reasonable person would likely conclude he did not. So… after multiple reverse stock splits (effectively wiping out the investments of scores of investors), a few company name changes, multiple promotion efforts, and multiple public press releases… the stock now sits at .008 as we write this post. AND… the current PPS comes just 2 days after a massive promotional effort (details here). Never a dull day with Mr. Samblis.